The good news: 2013 was a good year for most businesses. 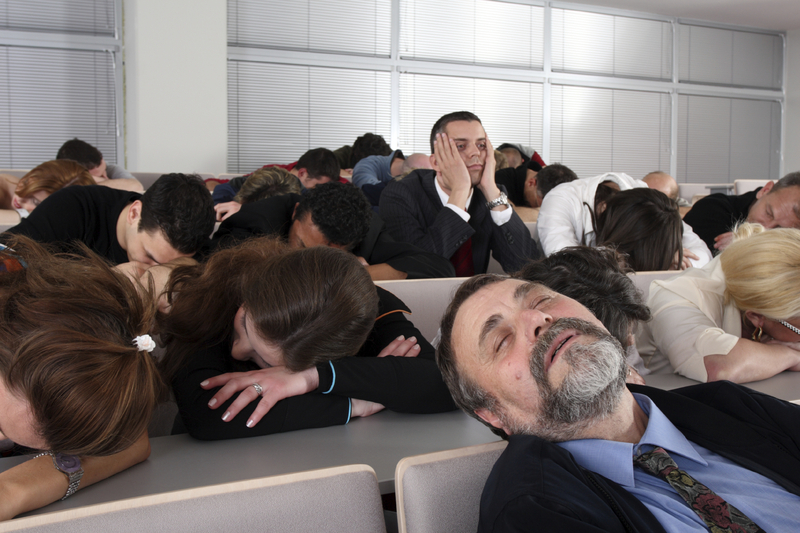 The bad news: Most business presentations delivered in 2013 still sucked. 1. Engagement – Most presenters are content experts. Great presenters focus on engagement as much as they focus on content. Your audience wants more than just good content. They want you to be interesting. 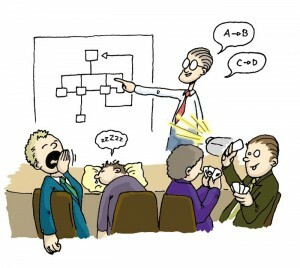 They want more than the same old boring business presentation. 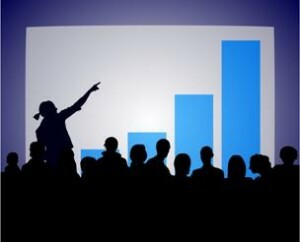 Interactivity, stories, examples and anecdotes are all engagement tools that will enhance your presentations. 2. Better slides – Not more slides, not more stuff on your slides, just better slides. Effective slides have limited text on them and can be consumed in seven seconds or less. 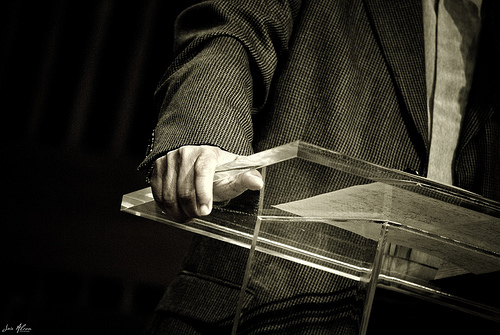 Your presentation should not be an attention-seeking competition between you and your slides. It’s often said that many presenters are at their best during the Q&A because they’re not handcuffed by a slide. Think about that the next time you’re trying to get your slides to work for you, not against you. I learn a lot from my clients. 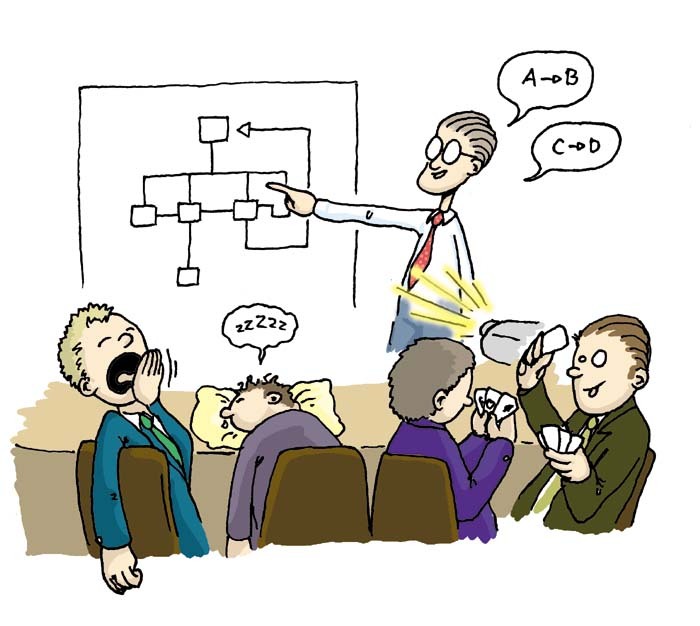 Recently, I witnessed a couple of clients who had dramatically improved their presentation effectiveness. Their delivery was good, their engagement level was good and the content was clear. But do you know what the real secret sauce was? Their slides really worked for them, not against them. They had simple, easy-to-understand slides that supported and reinforced their strong verbal content. Those text-filled, complex and cluttered slides may work well in a presentation document that is sent to people via email and then read like a document. But when busy slides are put up on a screen or discussed at a meeting, the audience tunes out the presenter. This is frustrating to you, the presenter, because the presentation should be all about you, your golden verbal content, and your valuable context. The focus should be on you, not the slide. I see a lot of presentations every week. Many of these presentations are investor pitches from small technology companies. Most of these investor pitches are bad … really, really bad. They’re poorly prepared, not well structured, confusing and riddled with jargon.